A beautifully illustrated new book has recently been received from author Walter Richter entitled "Schone und Seltene Pflanzen" (Beautiful and Rare Plants), published by Neumann Verlag, Leipzig, Germany. It is written for the plant lover and gives detailed cultural information and descriptions of many decorative plants that may be grown in the home or under glass. 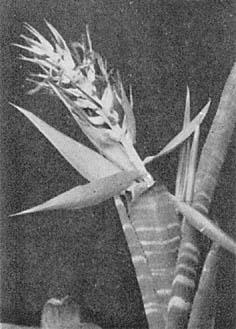 The 277 illustrations in black and white cover a large number of plant families; the Bromeliad Family is well represented by 51 photos, showing quite clearly the favorites of the author, Walter Richter, member of The Bromeliad Society. 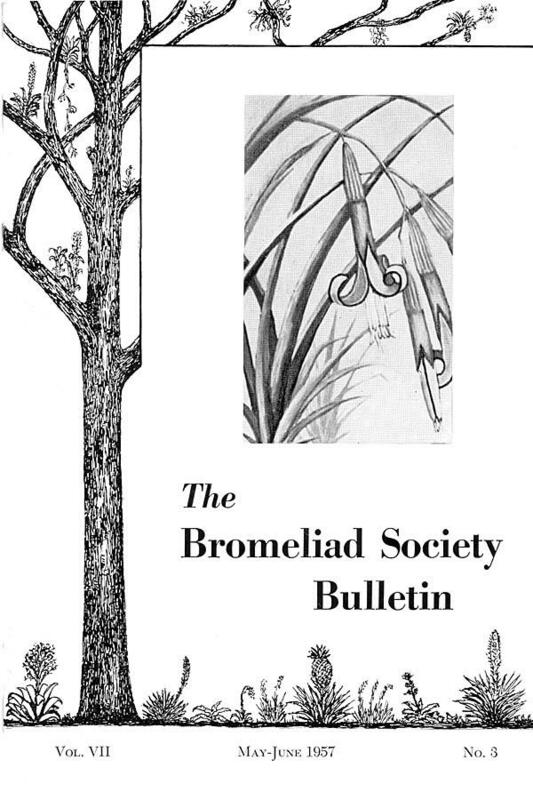 A short trip to Mexico during April 1957 did not in any way relieve the congestion on the editors desk, but it did renew the acquaintance with many members of the bromeliad family as well as make a first meeting of several new ones. This was my fifth trip to that great land. It was a hurried one. Via air from Orlando-Miami to Mexico City where I met Mr. and Mrs. Oather VanHyning of Winter Park, Florida. Just a few hours after my arrival there we left in their station wagon for southern Mexico. It became ani intense campaign, concentrating solely on bromeliads and, regrettably, I found that, in spite of all I had taken on previous journeys and what was now found on this excursion, I had barely started in the bromeliads of Mexico, such endless thousands met us on every mountain, in every valley. Fortunately I was in the company of two very enthusiastic, tireless and eager bromeliad "hounds," who never wearied of searching for one more bromeliad! Because we were trying to gather together as much material as possible on the genus Billbergia for this issue, I recalled a painting, "Macrocosmic Revelation," executed by my husband in 1931 which I first saw hanging in his studio in 1934. When I asked him for an explanation to the strange title the following thoughts came forth as well as I can recall them. Revelation comes through observation and well developed sensitivities. The eyes may see but it may not be that they also observe; they may only see the surface or a mere outline of a form. The intrinsic beauty lies not hidden but unobtrusive, ready for revelation to more penetrating eyes. People who can neither analyze nor imagine cannot project themselves either above or below or beyond the obvious thing in front of them. They do not combine their eyesight with their mind-sight. 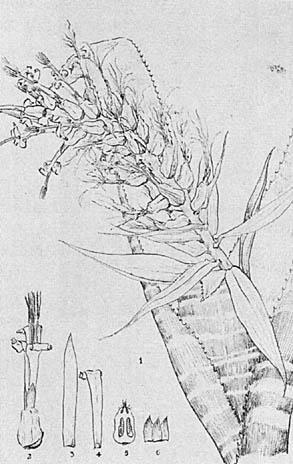 In order to reproduce the macrocosmic revelation of this particular plant (Billbergia nutans), the artist-philosopher has enlarged many times what is otherwise a rather insignificant grass-like plant which is often overlooked. Hundreds of people pass it by without noticing it even when in full bloom. However, to those to whom it is shown, it becomes a great revelation to find such startling color and form in so unobtrusive a plant. In fact, it is many times more beautiful than they would expect from this grass-like plant. This experience, reiterated often, prompted him to solidify this beauty, as it were, and he attempted to paint this revelation, with a life-size plant insignificantly in the background for comparison with the enlarged plant in the middleground; thus the oversize inflorescence in the foreground reveals a miracle of beauty which showers out in iridescent color and form. The stamens in the painting are the size of the actual live-size flower. Thus the observer can vicariously experience the insight of the artist-philosopher when one searches deeply. Billbergia velascana Cardenas, nov. sp. Phanerophyta (Helicodea) pulcherrima, 60 cm alta. Folia rigida, rosulata, compresa; lamina ligulata abrupte acuta 60 cm long., 20-50 mm lata minute spinosa, cinereo viridia, transverso albido maculata. Scapus 40 cm longus, 8mm crassus, denso flocculosus; bracteae lanceolatae 16-19 cm longus, roseae. Inflorescentia simplex, curvata, multiflora. Bractea florigera ovata, acuta, 8 mm longa, membrancacea, rosea. Flores sessiles, 6-8 cm long. Sepal a ovatolanceolata 12 mm longa, inferne viridi, superne violaceibus, glabra, flocculosa. Petala 5 cm longa, lineare lanceolata 6 mm lata coerulea, 2 squama alba ad basin praedita. Stamina 5 cm long., filamenta diluto coerulea, antherae filiformia, 2 cm longae, undulatae. Stylus 5 cm longus, atro coeruleus. Ovarium ovato conicum 12 mm longum, trigonum, sulcatum, albo flocculosum. Bolivia. Provinci Velasco. Departmenti Santa Cruz. Prope divi Ignati, 500 m.
Handsome plant, 60 cm tall. Leaf-blade ligulate broadly acute 60 cm long, 20-50 mm wide, covered on both sides with cinereous scales, densely serrate with horizontally or upwardly directed, 2 mm long, light brown teeth, gray-green with handsome transverse white bands, outwardly curved. Scape about 40 cm long, 8 mm thick densely white flocculose; scape-bracts lanceolate 16-19 long, rose. Inflorescence simple regularly many-flowered with a white flocculose axis. Flower-bracts ovate acute, 8 mm long, membranaceous, flocculose pink-magenta; sepals ovate acute 12 mm long, green below, violet above with a pink border, nerved, glabrous, flocculose; petals linear-lanceolate, broadly acute spirally recurved 5 cm long, cobalt blue, bearing 2 white, 2-toothed short scales at their base. Stamens 5 cm long, light blue, lilac; anthers filiform, 2 cm long, undulate. Style 5 cm long, dark blue longitudinally 3-striate; stigma trifid, violet, 5 cm long. Ovary ovate to conic, strongly trigonous, 12 mm long, sulcate, white-flocculose; epigynous tube 12 mm long. Bolivia. Province of Velasco. Department of Santa Cruz. San Ignacio, 500 m. December 1955. Collector, Father Lorenzo Hammerschmidt. No. 5486 (Type) in Herbarium Cardenasianum. 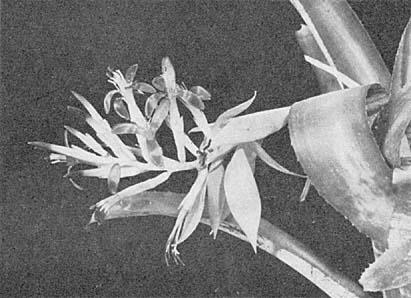 This is the third species of Billbergia found in Bolivia. This is related to B. Cardenasii L. B. Smith. It differs, however, by its stouter habit, more dense spines on blade borders, less densely flowered inflorescence, longer flowers, narrower sepals, ovate and narrower cobalt blue petals. Q. During two successive years I have had Billbergia nutans form scapes that failed to develop; growth stopped when they were three or four inches long. This year one spike matured, others in the clump are hanging fire. The plant had been outdoors during the summer, but was brought in during cold weather. Would decreased light check the flowering once the scape had formed? A. We doubt if the development of inflorescence would be delayed by change of light, once the inflorescence had been formed. Possibly this plant had not been brought in soon enough. In the commercial production of greenhouse chrysanthemums, it is possible to have plants in flower for any specified week of the year. Careful control of the daylength and temperature makes this possible. Chrysanthemums, poinsettias and many other flowering plants initiate and develop flower buds when the days are shorter than a critical length; while snapdragons and nasturtiums flower sooner under long day conditions. Some plants such as roses and carnations are indifferent to daylength as they produce flowers throughout the year. 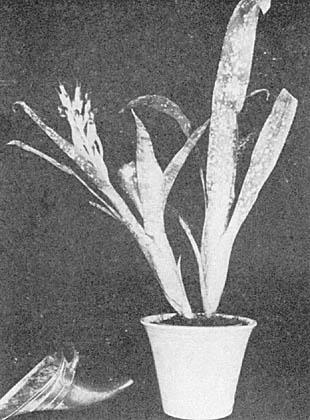 Results of experiments with Billbergia nutans at the Waltham Field Station of the University of Massachusetts indicate that bromeliads are sensitive to day-length. The fact that bromeliad species flower at essentially the same time each year also suggests that daylength is a controlling factor in determining the date of flowering. The data presented in Table I demonstrate that B. nutans is a short day plant. Plants maintained under short days flowered four days sooner than those grown with normal daylength. Extending the length of day with artificial light delayed the flowering date from the normal January 19-20 until April 1. Table 1. Effect of daylength on the flowering of Billbergia nutans. Daylength treatments began September 1, 1955. Average 30 plants per treatment. Long days started September 1 delayed, but did not prevent, flowering of B. nutans. This fact indicates that buds probably had been initiated before the lights were applied. Otherwise, long days would have prevented flowering in plants requiring short days for flower initiation. Plants grown under long day conditions produced a large number of basal vegetative shoots during the short days of the winter months. Normally new vegetative shoots are not produced until after flowering when the days become longer. 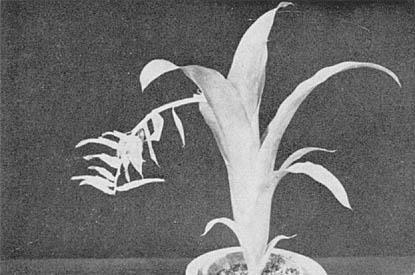 For this experiment, plants were divided during May, 1955. Individual vegetative shoots were planted in a 4-inch pot containing a mixture of 3 parts composted greenhouse soil, 2 parts of sphagnum peat moss, and 1 part coarse sand. Plants were grown under full light intensity in the greenhouse at a minimum night temperature of 60-62°F. Approximately once a month, a complete 20-20-20 fertilizer solution was applied. On September 1, plants were selected and divided into three similar groups. The first group (Treatment 1) was maintained under normal daylength conditions prevailing in Massachusetts. The second group (Treatment 2) was covered each evening at 4:30 p.m. with black sateen cloth to exclude all light. The third group (Treatment 3) was grown under long days by lighting the plants for 4 or 5 hours during the middle of the night from 100 watt mazda bulbs spaced 3 feet apart, approximately 2 feet above the tops of the plants. As the length of the night is the important period governing flower bud initiation, lighting during the middle of the night breaks up the night into two short nights, which acts as a long day. The lighting and black cloth treatments described above are used commercially to control the flowering of chrysanthemums. By knowing the specific day-length requirements of individual chrysanthemum varieties, the flowering date can be controlled exactly by creating artificial short or long days. In a similar manner, once the daylength requirements and the date of bud initiation of B. nutans are known, it may be possible to flower this species at any time of the year. It will be necessary to subject other bromeliad species to similar experiments before their date of flowering can be controlled. Experiments are now in progress to study the effect of temperatures and daylength on the flowering of B. nutans. Results of these experiments should provide information on the factors controlling bud initiation. It may then be possible to flower this particular bromeliad at any time of the year. Dept. of Horticulture, Penna. State Univ., University Park, Penna. This is a fascinating plant of striking contrasts. The big cluster of rock-gray, saw-toothed funnel-like plants do not suggest its fairy-like flower of flowing lines and subtle hues whose beauty stands out best against a background of dark foliage. There the blue tips of the glossy, almost transparent petals look bluer and the anthers shine like gold. Despite its striking appearance this bromeliad is not easily discerned by human eye in the rain forest. The humming birds, however, find it. These iridescent, miniature "helicopters" feathered in dark blue, rusty brown or bluish green, often come to visit the flowers. They recognize the plant even when it is not in bloom for they come to look even then as if in search of something. Flowering occurs during the first part of winter, and all plants bloom about the same time. The inflorescence develops within a week counting from the day it is first seen in the depth of the water-filled tube to the opening of the first flower. Blooming extends over a period of ten days to a fortnight, depending on the size of inflorescence. There is a flower in every branchlet. Afterwards colors fade but the graceful lines keep for another while. Billbergia elegans is not easily discerned in the rain forest. When growing on an exposed spot on a tree, individual shoots, of this B. elegans, have a narrower shape, like a thick tube, than when grown near the ground. Planted in, soil the rosettes grow broader, and the upper half of the blades curve outward before ascending again, while corners of the blade tips descend. Also, the leaves take on a rich green with a faint gloss having only a suggestion of gray. New shoots which sprout at the base of old ones mature in two or three years. The large scape-bracts enfold a branchlet with one to four flower buds. The peduncle and pedicels are a pale brownish green. The flower bracts are small, and pastel pink. Dark blue tips of buds, sprinkled with a few white scales thrust forth from the scape bract while the peduncle is half of its final length. The first flower to open is one of the apical bunch, and it does so while the bracts still converge. On the following days the bracts rise to a horizontal position and one flower opens in each branchlet, each flower lasting three days. The last one to bloom is also one of the tip. The petals have a silky shine and are rather tough to the touch, although they look practically transparent. The nectar scales on the petals are truly transparent and come in pairs and are toothed at tip. Besides the humming birds, other fauna visit this Billbergia. In the depth of the corollas live small white mites as well as a larger, grayish one which resemble a tick in shape. One of my plants was inhabited by a tree frog, larger than Flectonotus which sang in March, giving one short call at irregular intervals. 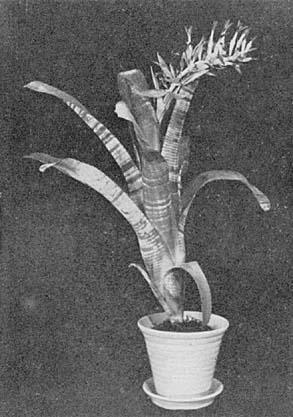 A half-grown shoot was occupied by a female Flectonotus from November 14 to December 10th in 1955. On December 6th she was first seen with twelve eggs on her back. For several days she was always found in the same spot in this Billbergia a little above the water line. The eggs disappeared from her back, a few at a time, on successive days. On December 10th only two eggs were left. After that she was not seen again. Evidently this Billbergia is a favored haunt for this species as I have seen other Flectonotus frog ladies in other B. elegans tubes. Bats, also, come at night; they carry away ripe Billbergia fruit to their resting places where they drop the empty shells completely flattened, devoid of jelly and seeds. However, the seeds are not lost; they were found to be in the droppings and when planted they germinated within ten days. This gives rise to contemplation as to how the bromeliad flora is spread and constantly replenished by flying creatures other than the well-known birds. Billbergia Euphemia var. purpurea M. B. Foster var. nov.
A var. Euphemia foliis purpureis differt. 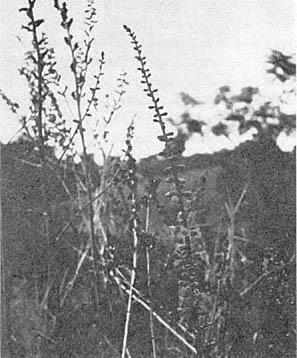 Collected in Brazil; growing on rocks in full sun near Domingo Martins in the state of Espirito Santo, July 24, 1939 by M. B. & R. Foster No. 3017; Type U. S. Nat'l Herbarium. This plant was in our garden five years before it flowered. Unlike the typical variety of B. Euphemia which has apple-green leaves with grey bands, this new variety has reddish-purple leaves and does not show the typical gray bands of the other varieties. The richly colored leaves make an especially fine color combination with its lovely blue flowers and luscious pink scape bracts carried on its nodding inflorescence. Billbergia × "Muriel Waterman" M. B. Foster hybr. nov. This new hybrid was made in 1946 and flowered in 1950 for the first time. It is certainly a most striking and stunning plant whether in flower or not. The semi-nodding inflorescence does not carry the delicate pastel colors of pink and blue that was the contribution of B. Euphemia var. purpurea because the transparent blue-green petals of B. horrida var. tigrina pulled them down to a more earthy combination of dull pink bracts and steel blue flowers. Every compensation was made, however, to a complete climax in the combination of the reddish purple leaved Euphemia which created a blend of a rich plumb colored background highlighted with vivid silver grey bands which were donated by B. horrida. Billbergia × "Muriel Waterman" Detail of the inflorescence of B. × "Muriel Waterman"
In naming this hybrid for Mrs. Muriel Waterman of Auckland, New Zealand I am honoring her in acknowledgment of the tireless enthusiasm and interest she has shown for the bromeliads and the Bromeliad Society. Mrs. Waterman possesses–or shall we say, the largest collection of bromeliads "Down Under" possess Mrs. Waterman! If you named the ten largest collections of bromeliads in the world, her collection would be in that Royal Group. Less than ten years ago she was an incurable addict of cacti and succulents but when bromeliads came into her heart, the cacti gradually left her garden. We have never had the pleasure of seeing Mrs. Waterman but we have always felt that she lives just across the street because so many plants from our garden have gone over to live in her garden. Mrs. Waterman, herself, is somewhat of a hybrid for she was born in Iowa but has spent most of her very active life in New Zealand. M. B. Foster hybr. nov. This new hybrid was made in 1942. It is outstanding in both its decorative and horticultural qualities. The growth habits of this hybrid inherit the prolific propagating propensities of the winter-blooming B. pyramidalis parent, the clone of which the author found in Brazil in 1940. The well-known species B. pyramidalis, (so commonly found in Florida gardens), is a late summer and fall bloomer and is NOT the parent of this hybrid "Fantasia." Rather, the parent clone, which was used to make this hybrid, has, by contrast, glaucous blue-green leaves and it blooms in the winter, whereas the common fall-blooming phase has glabrous yellow-green leaves. The flowers, however, of these two clones are so similar that I doubt if anyone could distinguish them even when viewed together. The paternal parent, B. Saundersii, is a very much more variable one than B. pyramidalis; quite a number of various forms are in cultivation, each having its own growth and color habits. The form used in making the hybrid "Fantasia" was one with well colored and spotted leaf markings. Billbergia × "Fantasia" may flower in the fall or in early spring according to the time of maturity of the individual plant. The flowers favor the B. pyramidalis parent in both shape and color, and while this hybridizer feels that these flowers are, perhaps, not as fine as those of either parent, the showy offspring, in leaf-color and plant-form is reward enough; it is definitely superior to either parent. Many unsuccessful attempts have been made by the writer to set seed on this hybrid "Fantasia". Pollen from other species of Billbergias as well as itself has been used, but always without success; it appears to be sterile. Several years ago bromeliads suddenly thrust themselves upon me. Prior to that time even the name was unknown. If memory serves me well, several specimens in a florist's show window in New York City caught my eye and then and there "cooked my goose"! Shortly afterward a catalogue came to hand and this immediately produced symptoms of "bromelitis". After reading the description of the many plants listed, I sent for Billbergia pyramidalis, Aechmea miniata var. discolor, a Cryptanthus, Vriesia × Marie (carinata) and Neoregelia spectabilis. As it turned out this pretentious order was an excellent choice for a novice. Both Vriesia × Marie (Painted Feather) and Ae. miniata discolor produced inflorescences promptly and were beautifully interesting for a long time. Gifts to friends have also done well. Billbergia pyramidalis (Urn Plant) was shy. The original specimen, although of superb form and vigor did not effloresce, but daughter shoots appeared. These were separated in good time and given their own pots. Growth of one was particularly good. In the summer of 1955, which was unusually humid even for Long Island, N. Y. this daughter was given a vacation outside under a peach tree. Imagine, my surprise, one day, to see a striking salmon-pink structure emerging from a brightened green crown. The pot was immediately taken into the house to prevent damage by children, animals and other predatory forms of life. During the next two weeks, maturation was closely followed and finally kodachromes were taken. The pleasure afforded by this incident was unique in my experience and most stimulating. After efflorescence, side shoots appeared. These are being nurtured. As for Neoregelia spectabilis (Painted Fingernail), to the best of my knowledge the original plant did not bloom, but a shoot appeared a couple of years ago and has grown into a perfectly formed plant specimen. There is also another smaller but presentable daughter shoot. All in all, my experience with bromeliads has been most satisfactory. As a house plant for the novice, they are, in my opinion, among the best, having a long life without coddling. 165 Wellington Road, Garden City, N. Y. 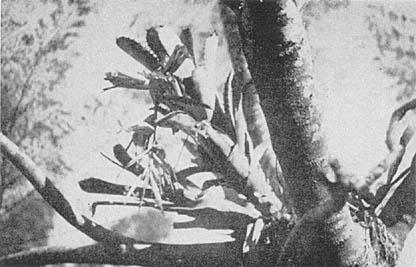 When I flew to Brazil in October 1956 it was to make a general floristic survey in the planalto region centering in western Santa Catarina, but bromeliads turned up from time to time even though it was a distinctly unfavorable trip for them. A two-day visit in Belem near the mouth of the Amazon produced nothing of note, but the next stop in southern Goiàs was much better. Amaro Macedo, my pen friend of many years, met me as I left the plane at Anapolis, and for a week we toured the region already made famous by the collections of Saint-Hilaire, Pohl, and Glaziou. On our first trip to the Serra dos Pirineos we found a large Dyckia and several species of Bromelia. The Dyckia was all too old for identification, but there is still hope if Mulford Foster can grow it from the seed we sent. Strangely enough the handsomest of the Bromelias is the still uncultivated Bromelia villosa. It is a species like Bromelia karatas, with the flowers down in the center of the rosette, but its leaves instead of hiding the flowers are spreading with brilliant red bases that make it a truly spectacular plant. Another characteristic species of the region was my recently described Bromelia interior. The next day we visited Abadiania and saw some of the "campo cerrado" country so typical of southern Goias. This is rolling grassland with low gnarled trees scattered through it. The trees ultimately cut off the view, but usually are far enough apart to allow the passage of a jeep. The small watercourses are all enclosed by gallery forests which, although very narrow, are miniature jungles with big trees, lianas, and epiphytes. Here we found a tremendous Philodendron and Tillandsia geminiflora and other bromeliads characteristic of the coastal rain forest. During the rest of the week we visited the Subestaçao Experimental de Anapolis, made a second visit to the Serra dos Pirineos, and went out to the Horto Florestal in Sylvania. This last trip was memorable for the terrible road, a yellow butterfly migration, and the large number of Bromelias in bloom. From Anapolis I moved on to Santa Catarina with short stops at Belo Horizonte, Rio de Janeiro, and Sao Paulo. These stops were too brief for any field trips, but I identified various live bromeliads in cultivation and saw some very interesting herbarium collections made since the publication of my "Bromeliaceae of Brazil," and including a number of undescribed species. On the last day of October, I landed in Itajai, principal port of the state of Santa Catarina and home of the Herbario "Barbosa Rodrigues." Here I met Padre Raulino Reitz and Roberto Klein, my partners in the field for the next six months. In 1952 we had studied the rich rain forest of the coastal slopes in connection with bromeliad malaria, but this time we were to do most of our collecting and research west of the divide on the planalto. While we were waiting for the release of my baggage from customs we made a number of short trips in the familiar coastal region and found old friends like Aechmea nudicaulis, ornata, and recurvata, Neoregelia laevis, the southernmost species of this genus, and Vriesia erythrodactylon, incurvata, gigantea, and philippocoburgii. Once we drove far up the Rio Itajai beyond Ibirama and found masses of an unnamed Dyckia on the bare ledges by the river. After my equipment was clear of customs, Roberto and I jeeped through the eastern part of the planalto collecting all types of plants. We journeyed several hundred miles through alternating campo (prairie) and pinheiral (forest dominated by Araucaria or Parana pine) and saw practically no bromeliads until we reached Campo Alegre, just west of the divide on the Parana line. Here we climbed the peak known as Morro Iquererim and from the start found Aechmea distichantha and ornata in considerable quantity. Aechmea ornata was particularly interesting in the way its leaves varied from short and stiff in the sunlight to sprawling and over a yard long in the deep shade. After a long hike up through the forest we came out on the grassy upper slopes. Scattered here and there were giant boulders looking exactly like those left by glaciers in northern United States and Canada, but most of them had a very unglacial covering of bromeliads. These bromeliads were long past their prime with old and withered inflorescences hanging down beside their vase-like rosettes, but there was enough evidence left to indicate that they were our biggest discovery, the first Quesnelia from Santa Catarina. Whether they represent a variety of Quesnelia imbricata or a new species is a question that requires further study. The middle of December was the beginning of the summer vacation in the school where Padre Raulino taught, and from then until the end of January he replaced Roberto as my partner in the field. Our first expedition was a big circuit clear to the Argentine border and lasted over three weeks. We drove west along the northern border through larger and larger tracts of pinheiral without sighting any bromeliads, and then near the last small area of natural grassland at Campo Ere we entered the homeland of one of our most handsome ornamentals, Bromelia balansae (see Bromeliad Society Bulletin, vol. V, p. 60). The local people, however, were quite unappreciative and regarded it as a vile weed that was almost impossible to destroy. On the return trip we came by the southern route and visited the Estreito de Uruguai, a rocky gorge where the great Rio Uruguai narrows to the width of a city street and accelerates accordingly. It was low water and the protruding boulders were covered with one of the Podostemaceae, a flowering plant that looks like a seaweed. On bare ledge, but above high water, were masses of Dyckia distachya. Our next trip was down the coast to Pôrto Alegre in Rio Grande do Sul where we visited Padre Rambo and his Herbario "Anchieta." Coming back by the inland route to Lajes, we passed through a recent deep road cut where Dyckia maritima had colonized the new banks like a weed, but with handsome brown and yellow panicles (see Arquivos de Botânica do Estado de S. Paulo, vol. 1, tab. 108, and Bromeliaceae of Brazil, fig. 13). The remainder of my stay in Santa Catarina produced little of note in bromeliads, but as I started my homeward trek they began to appear again. In Parana, Gert Hatschbach and Dr. Angely took me on a trip down the Serra do Mar to the Bay of Paranagua, over territory made famous by the collections of Dusén. The bromeliads most in evidence were Vriesia incurvata and rodigasiana. An unnamed Dyckia far up the Rio Itajai beyond Ibirama, Sa. Cat. row which I passed very pleasantly roaming the back roads of the Federal district. The first holiday I climbed Tijuca, highest peak inside Rio. There the most spectacular bromeliad was Vriesia regina, perched on the smooth precipitous rock walls just below the summit. The following day I hiked the mountain road from the Corcovado to Alto da Boa Vista, past fiery masses of the well-named Pitcairnia flammea. Finally I went down the coast past Pedra Dois Irmaos and Gavea to the Restinga de Jacarepagua. On the dripping rocky flanks of Pedra Dois Irmaos I saw what is undoubtedly the granddaddy of all our cultivated Gloxinias (Sinningia), and on Gavea were myriad swarms of Vriesia regina, all completely inaccessible to anything less than a helicopter. After Rio a short trip in Sao Salvador gave only time for herbarium business, though in 1952 I had seen some of Mulford Foster's discoveries there such as Hohenbergia littoralis. However, I was able to make plans for future operations with Dr. Seabra and Dr. Leal Costa. In Recife, I was received by Dr. Bezerra of the Instituto de Pesquizas Agronômicas and given every aid in the herbarium by him and his staff. Dr. Siqueira Carneiro, physician and amateur botanist, showed me the Jardim Botânico with masses of Canistrum aurantiacum growing wild, and then his private garden with many of the local bromeliads. Although Recife lies in a very humid region he was growing such semiarid types as Tillandsia streptocarpa and loliacea quite successfully. At Belém I completed the circle returning to the start of my Brazilian expedition of 1956-57. For two days I tried to pack in a maximum of activity. Once again I worked at the Instituto Agronômico do Norte where every facility was accorded me by Dr. Rubens Lima, the director. This time I visited the Museu Goeldi, famous for its Amazonian collections, and met its new director, Dr. Egler, whom I had known in 1952 when we collected together in the State of Rio de Janeiro and in Minas Gerais. I also met Dr. and Mrs. Causey, a husband and wife medical team, who had been mainly responsible for my bromeliad malaria trip in 1952. They are studying viruses now but have not lost their previous interest in bromeliads. They told me of how the monkeys keep the bromeliads from being too prolific around Belém by eating out the heart and dropping the hollow rosettes by the score to litter the ground below. On May first I returned to Washington and my office in the Herbarium, but my bromeliad experiences were not over–just beginning again. There waiting for me were the galley proofs of my Bromeliaceae of Colombia, some 392 species to be verified before publication. United States National Museum Smithsonian Institution, Washington, D. C.
1. Expedition made on a grant from the National Science Foundation. When growing bromeliads from seed it is the writer's firm conviction, based on experiments over nearly three years, that the most essential ingredients to success are as follows and in the order given. The seed must be as fresh as possible. The atmosphere must be damp but buoyant. The temperature must be sufficient to germinate but not excessively hot and should be free as possible from fluctuation. The compost must be open, sweet, and be in sufficient quantity to insure that frequent waterings are not necessary. Once the seed has sprouted and is large enough to handle, it should be pricked out into community pans. (Shallow pans are less liable to "go sour" than pots) and receive more open air to harden them off and thus prevent damp-off. This period of transition is fraught with danger but is blessed if kept in the same atmosphere as the younger plants for a short while to recover from the shock. As regards temperature the writer's experience showed if undue heat was used damp-off seemed inevitable and the survivors were weaklings. Various plants require different temperatures but the writer's experiments on that score are incomplete. Once the seed has germinated and the seedlings are about to form their root systems, they are pricked off into community pans but varying the soil to suit. Puyas and other sun lovers more sand and less peat is used. Neoregelias and Aechmeas less loam is used. Vriesias also get less loam but extra sand. As far as mature plants are concerned the writer is now convinced that the cardinal sin is too much water. The February 1957 issue of the German Nature Magazine "Kosmos" brings a notice by Dr. D. Aichele on an article published in another German periodical, "Die Naturwissenschaften" (42nd year of publication, pg. 611, 1955), by H. v. Witsch and J. Sieber, on above subject. The author of the notice points out that it is often stated that in Bromeliaceae the function of absorbing food is completely taken over by the leaves, and that the roots of these epiphytes serve only to hold the plant to its support. He goes on to say that the scientists H. v. Witsch and J. Sieber disproved this. They raised bromeliads from seed experimentally and found that young plants of Nidularium innocentii even died if the roots were not kept in an atmosphere almost saturated with moisture, although water was being sprinkled freely onto the leaves. Their plantlets of Nidularium innocentii and of other bromeliads grew normally though, when the only means of obtaining nourishment was through the roots. A combination method of fertilizing both for leaf and root absorption gave best growth results. In the course of their experiments the investigators found further that nitrogen gets more readily absorbed through the leaves, while phosphoric acid and Kali (Kaliumoxyd) enters better by way of the roots. In support of the assertion that bromeliads absorb nutrients by way of roots, I wish to say that I once found an adult Aechmea fasciata on the forest floor where it had fallen off a tree, with its stem piercing the leaf-mold. The portion of the stem that was under the dead leaves had issued tiny white roots covered with short hairs. I took; the Aechmea home, but postponed planting it until next day. By then the rootlets had shrivelled and the hairs were gone. When planted in soil, at home, my Aechmeae, Billbergiae, Nidularii, Neoregeliae and Quesneliae grow a dense mass of thin but strong, branched roots. When tied to a branch, Aechmeae, Billbergiae and Quesnelia Liboniana develop roots only of the holding type, brownish, hard and lustrous, splitting up in thin short sections at their ends, and that cling tightly to the support. The plants do this also on rocks in the wilds. In Nature young plants seem to survive only when they happen to start out on a tree or on a rock, but not on the ground. Percentage of survival apparently is extremely low. Perhaps bromels, at least some of them, possess an innate ability to put forth roots of different kinds, responding to environment. In some cases it certainly looks as if nutrition is left wholly to the leaves.